There is a new resident in the Dr. Gladys M. Word Nursing Simulation Laboratory. 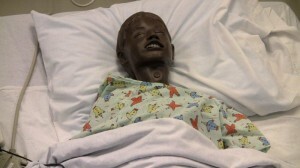 He is SimKid, a medium fidelity mannequin made by Laerdal Corporation to represent a six year old. He/she comes with the newest control pad which is a SimPad. SimKid can have an asthma attack with significant wheezes and tachycardia which will require the students to manage his/her care as well as communicate with his/her family members. This is just one example of the many proposals that are being discussed as we plan on the integration of this mannequin into our curriculum in order to foster creative scenarios that promote critical thinking for our students. Welcome SimKid to the Loser basement and to plenty of caring!